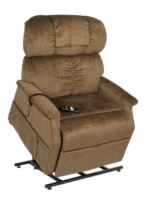 The Golden Technologies Comfort Medium Extra Wide features a 26" seat width and a 500-pound weight capacity. Like all lift chairs in the Comforter Series, this lift chair comes backed by Golden's lifetime warranty on the frame, lift mechanism, and scissor mechanism. Enjoy a lifetime of comfort too, because every chair in the Comforter series uses a patented spring system topped with a thick chaise pad.